Jonathan and I are scratching our heads a bit as to how exactly we managed this past winter in our 77 sq ft Folic camper. I thought I would share a few accounts of what it has been like to live in the Frolic this winter. 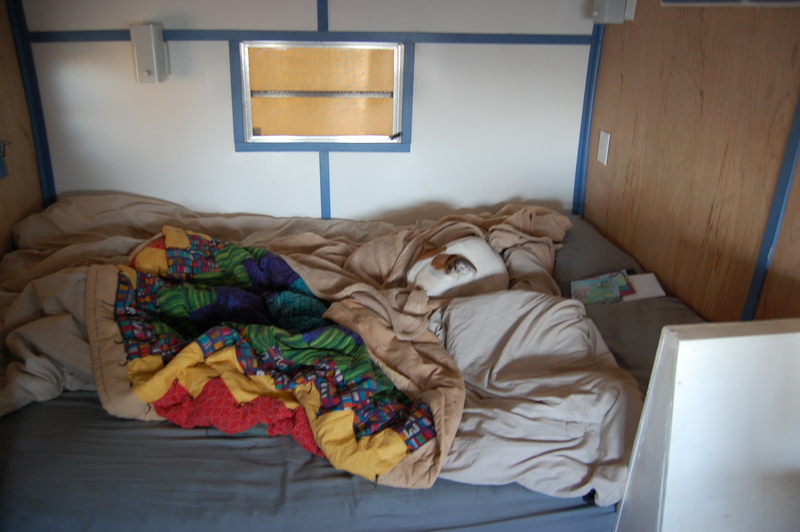 Living in the camper was quite nice and we adjusted to the colder weather. We played games, watched movies, read a lot and in general rested up. We did continue to work on the house and farm throughout the winter though not without our handy portable tea kettle (thanks to my Mom!) with us so we could make hot tea wherever we were working that day. 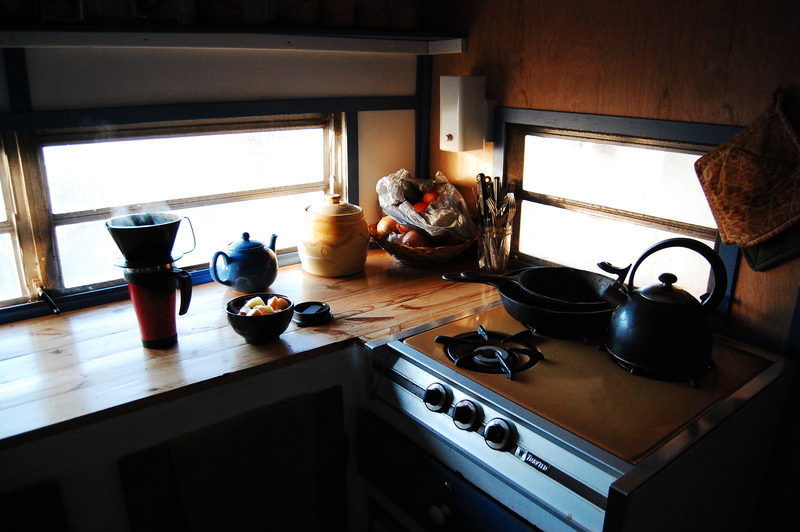 The winter sun flooded the camper each morning and on into the afternoon. 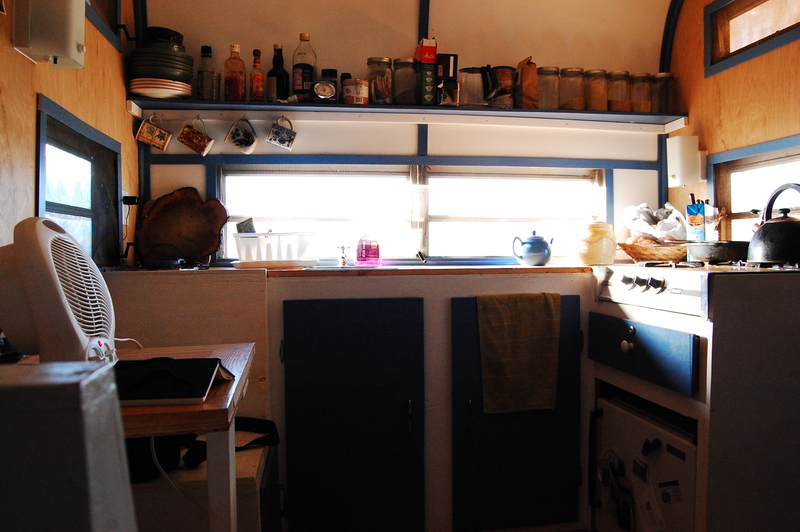 Now that it is mid-march, the sun is barely even reaching inside the Frolic at all. Amazingly our plants grew through the winter putting on very strong root systems. The above picture was taken in January during one of our coldest weeks. Hard to believe that there is any green at all to be found at that time of year! We had several snow storms, but the storm 2 weeks ago takes the cake! We were landed with 8 inches of perfect snow making for snow days from school and snow hiking. 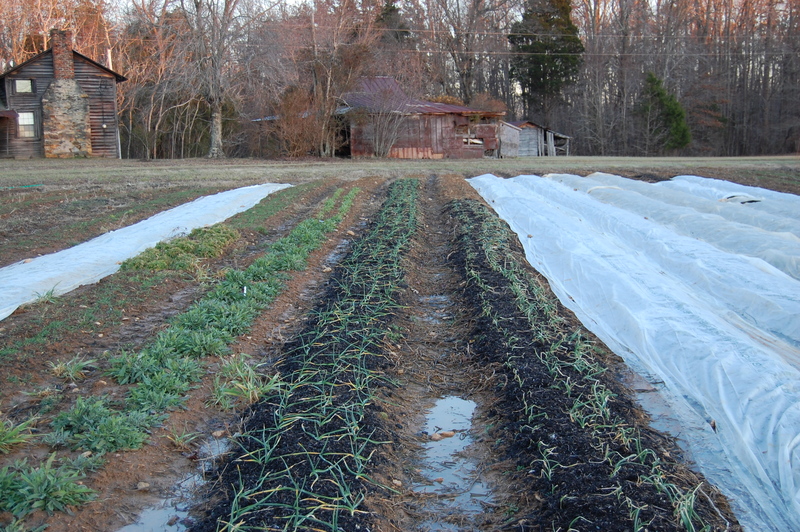 We had to go out in the night every couple of hours to sweep the snow off of our hoop house. They can collapse from the weight of a heavy snow like the one we had. Heating: Mr Bingley was a very necessary part of our heating system. 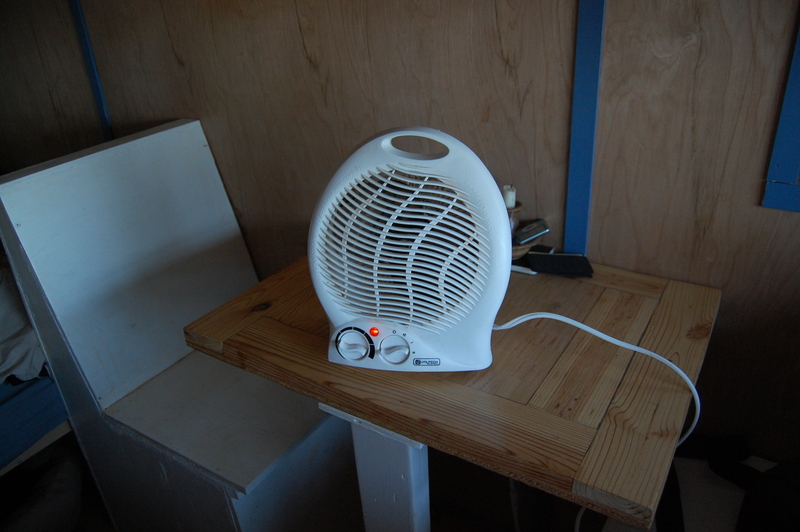 We used a small space heater for the camper this winter and it managed to keep the Frolic in the range of 48-55 degrees. Yes, that is Fahrenheit! Mr Bingley slept with us many night to help keep us warm (though we all know that all three of us thoroughly enjoyed him snuggling up with us). It is amazing how well we adjusted to living in lower temperatures. We still spent a lot of time outside when it wasn’t too cold. One of new favorite winter pastimes is to make a campfire, eat dinner and listen to a couple podcasts by the fire. The stars are amazing in the winter too, though a warm drink is essential to staying our long enough to stargaze. We had temperatures reach to 0 degrees here a few nights. We stayed in town those nights because it was so cold. However, when we returned home everything was frozen! My list of things that will freeze solid has grown quite long and here a few items for your enjoyment: wine, apple cider and balsamic vinegar, olive oil, mouth wash, soy sauce, eggs, face lotion, and of course all the canned goods outside on the shelf. Quite amazing actually. All in all, it was a great winter and I would do it again (that’s good since I will have to:). Now that the promise of spring is in the air it makes those cold nights and mad dashes to the outhouse seem far away. I love the winter season for its tawny beauty, quietness of soul and life and the warmth felt by fires and hot tea, but I am always ready for spring! We are making a big push right now to get everything done to put on our siding in a few weeks! Stay tuned for more. Wonderful reflection on this season of quiet joy. Beautifully written, too! So glad you got the flowers! I hope that they work well for you. We need to get you two out to the farm next month! First winter is almost behind you and spring-ing forth is on the horizon! 😉 Enjoyed your post and your pics! That is a LOT of snow, Mr. Bingley is almost a chameleon and your winter garden looks fabulous! My favorite though…..it’s gotta be the blue teapot. Lovely! Thanks for sharing! Thanks for your nice comment Aunt Teresa. The tea pot came to the Frolic after I was inspired by seeing yours over New Years! Thanks Bonnie! You and Mark come see us soon!